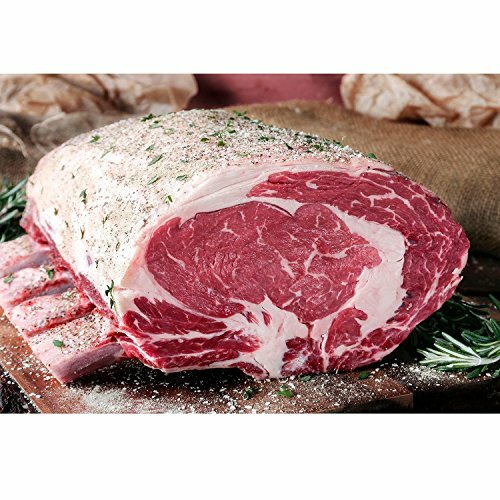 Black Angus Bone-In Prime Rib Roast - (7 lb.) by Rastelli Market Fresh at 365 Days Of Kindness. Hurry! Limited time offer. Offer valid only while supplies last. Quite possibly the most marbled and rich cut of beef, this roast-drippings, gravy and all-will satisfy any of the guests at your holiday soirée. Quite possibly the most marbled and rich cut of beef, this roast-drippings, gravy and all-will satisfy any of the guests at your holiday soirée. Tender, rich, and with the bone in for extra flavor, this Elite Black Angus Ribeye Bone-in Roast is wet aged for 21 days, hand trimmed and portioned to serve a crowd. Perfect for a special meal, even better as leftovers the day after. Garnish and seasoning in imaging was added to show how food may be presented. Garnish and seasoning are not included with your order.